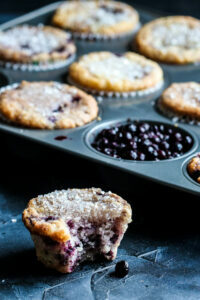 This recipe is going to amaze you! Marshmallow fluff made without eggs, how awesome is that? I couldn’t figure out just how to duplicate this much desired treat and then some genius discovered that you can use the whipped brine from chickpeas to mimic the consistency of whipped egg whites. Pretty, stinking amazing, right? In fact, when I first came across this recent finding, the list of ways to use this fluffy goodness started flooding my brain. IceCream….tastes even better then topped with a big ‘ol pile of marshmallow fluff. Cookies…..how about making a cookie sandwich with whipped marshmallow fluff as its center filling. 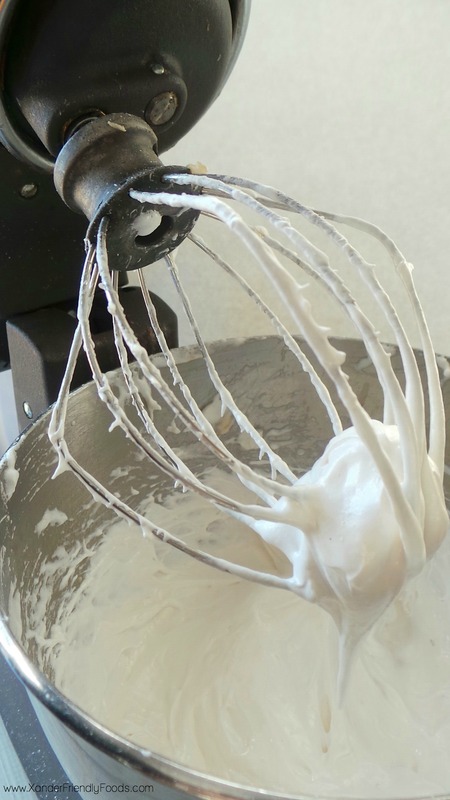 Cakes & cupcakes….instead of a traditional sugary frosting, how about a light and airy, whipped marshmallow-y frosting. Pies & Meringues…..toasted marshmallow fluff would steal the show on these baked pastries. Coffee….who doesn’t like a little cup of hot, caffinated, dessert inspired drink with a dollop of whip to top it off. While the list goes on and on, let’s just jump right into exactly HOW to make this Marshmallow Whip. It all starts with a can of chickpeas. Instead of and draining and tossing the brine (the liquid from the can), pour it into a sealable container and refrigerate until you’re ready to use. The above photo, shows what this brine with sweetener will look like when mixed with a “whip” attachment on high for 10 minutes. Be patient, you’ll see the small peaks start to happen. What you get is a very light whipped cream, similar in consistency to the whipped topping from a can which is pretty delightful, especially in hot chocolate. 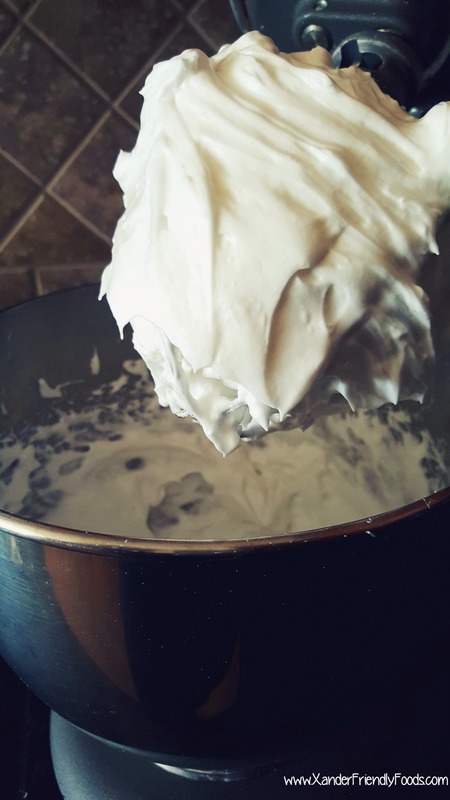 You could stop there, however, this post is about creating the perfect Marshmallow Fluff and for that, you do need to read on….. 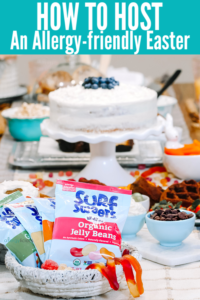 If you are looking for something a little thicker, something more like a sturdy frosting or a whip that will hold as filling, then you’ll want to make sure to also add in cream of tartar and guar gum. This will give you a shiny, sweet and much more marshmallow-like consistency. 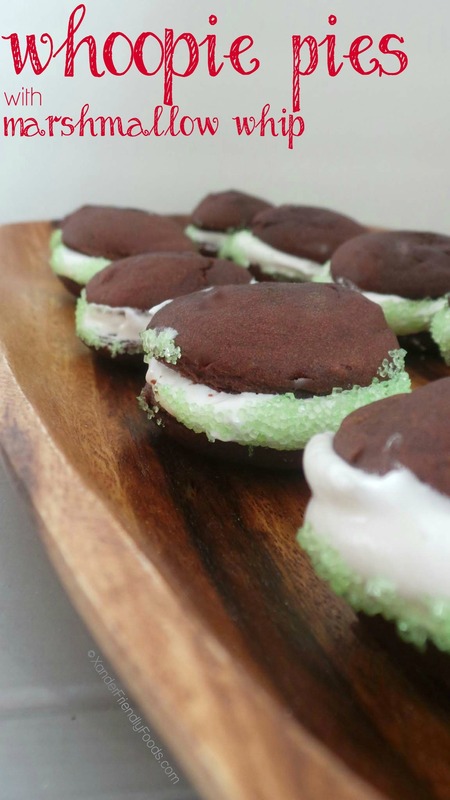 It is actually what I used for the center of my Peppermint Chocolate Whoopie Pies below (recipe is coming) and what will work best as a meringue topping. If you happen to have any leftover (which I highly doubt) or if you doubled the batch and made a little extra, just put your wonderful Marshmallow Fluff in a jar and store in the refrigerator until you’re ready to use. 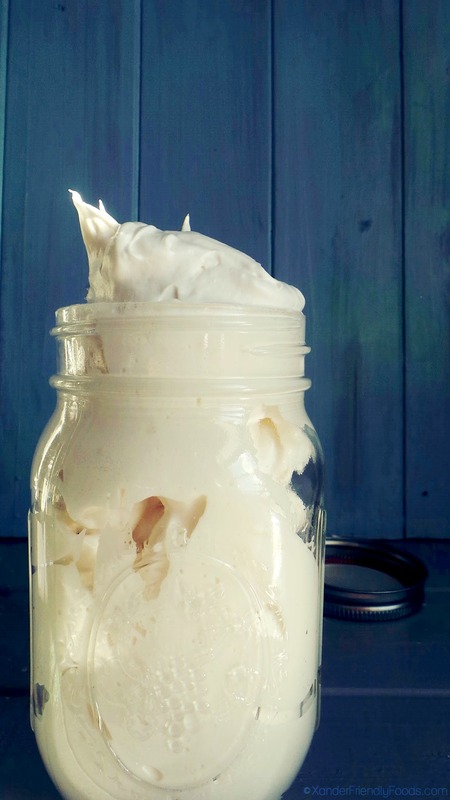 Homemade, Marshmallow Fluff! 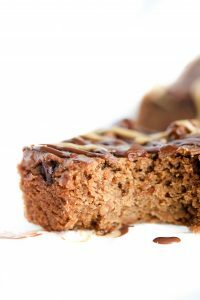 Completely Vegan, Gluten-free & free from the Top 8 Food Allergens! 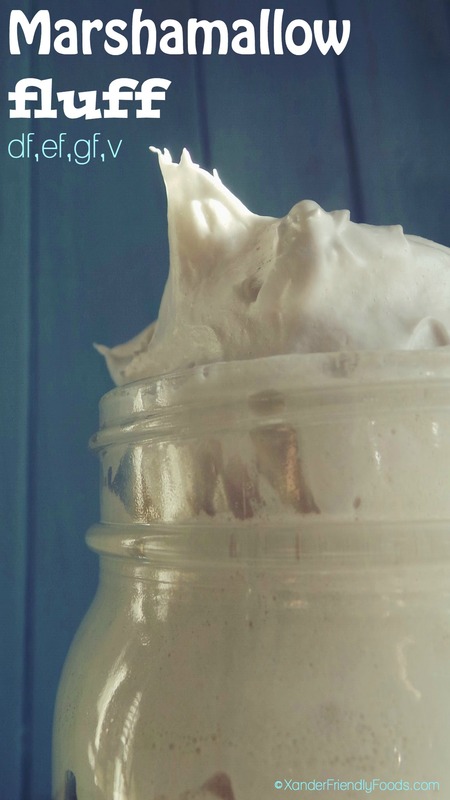 This Homemade Marshmallow Fluff will AMAZE you! Easy to make, egg-free and using chickpea brine as the secret ingredient……but no one has to know. Open your can of chickpeas and separate the chickpea brine from the chickpeas. Save chickpeas for another recipe and chill the brine for at least 1 hour. Place the chilled chickpea brine into the mixing bowl of a stand mixer. Using the whisk attachment, mix on low for 2-3 minutes, then add guar gum. Mix on high for an additional 10 minutes. Mixture will start to take on soft peaks and will have at least doubled in size. Slowly add the sugar, ¼ cup at a time. Allow the brine mixture to continue beating. Add the cream of tartar, and vanilla extract and allow to mix for another 1-2 minutes. Mixture will be rick and creamy, taking on the texture of melted marshmallows. Use to top ice cream, your favorite desserts or within your favorite recipe that calls for marshmallow fluff. You can always start with 1/2 C. of confectioner sugar and add to it. I just found that the extra 1/4 C. was enough to take out the bean-like taste that was still present at the time. Now this is OUTSTANDINGLY CREATIVE!! !